120429_4-track_DSC_4245, a photo by nevardmedia on Flickr. During the long hazy summer of '69, D6313 is captured near Great Wishford on the Wylye Valley route with a Westbury bound goods. The highly regarded Dapol Class 22 certainly looks the part on a secondary mainline with just a few wagons in tow. The unkempt finish and hazy light I think capturing the feel of the era which is now getting on for half a century ago. This is of course the era of free love, outdoor concerts and drug induced popular culture. Well, for a few dozen rich kids in Chelsea and Bath who could afford not to work and do very much as they wanted. For most, the 1960's was simply a little more plentiful and colourful than the 1950's, your normal working man still wore suits or overalls and had a short back and sides. These people are now all pensioners, which is quite scary to think, not because they're pensioners of course, just that it's now an awful long time ago. Talking of a more colourful world, colour TV kicked off in 1967 on the BBC, with ITV following a couple of years later. Most people didn't have colour sets until 1972, this being due to the Olympics being broadcast in colour for the first time, and I gather the Yen was also rather weak which helped. I do remember a 'posh lady' down the road had a colour set to watch the few programmes broadcast in colour, the thing I most remember was that she had the colour saturation wound up so high that skin tones were bright red. I imagine she wanted to make the most of her telly which in today's money would be several thousand pounds, that and of course the more expensive TV license. Back to the photo; you probably already know that this is the new(ish) Dapol Class 22 after a bit of weathering. I had thought of renumbering it, but I've never really been a number fanatic unless the former SDJR is involved, so for this reason it has remained as D6313. There so many variations between different locos, and because I'm in to atmosphere rather than number-crunching accuracy, I'd be opening myself up for a tirade of hate mail if I got the number wrong for the way the loco is detailed. But I get wound up about model railway bits that probably don't worry others, so each to to our own I guess (low pointless backscenes are my pet hate if you're asking). More pics of the Dapol Class 22 here. 120428_4-track_DSC_4215_BW, a photo by nevardmedia on Flickr. Sunday morning's bit of silliness is the replication of a stretch of mainline in South Wales with an ex-GWR pannier tank in possession of a rake of empties just having left the mainline. The 9F flying along behind has a load of freshly filled wagons heading for somewhere distant or maybe just Cardiff Docks. Sunlight has just started to penetrate the fog and pollution – also known as smog it was a typical feature of industrial Britain in the 1950’s and 1960’s. In the western world we no longer have smog because we exported it to China and other far east manufacturing nations, they now do the dirty work that we used to perform because we became too expensive to make toy chuffers at the price we want to pay. Back to the photo above, this little set piece is just a table bound mock-up using various rolling stock track photo thingies and a few of the coal industry buildings I have been building up over the last couple of years. The smog is of course Photoshop because I have no means generating smoke indoors unless I burn the toast, smoke a big cigar or hire one of those threatre fog making machines. 120418_johnson1P_IMG_3029_BW, a photo by nevardmedia on Flickr. This will be the last in this quad-track mainline series, for everyone much be getting bored to death! I really need to get on and do some other stuff, but it was set up under the lights all last week for some 'other stuff' and the temptation to snap I found all too much as you may have guessed! An elderly Johnson 1P built in 1901 gallops along the Midland Mainline in Derbyshire on a misty day in 1955. This loco turned 30 in January this year, I built it from a Craftsman kit all those years ago. Superglue was used in much of the construction, but 30 years in it's still in one piece. The chassis was recently rebuilt by Philip Hall, it now runs a dream and the wheels hardly ever need a clean - a tribute to Phil's workmanship. 120421_37422_IMG_3056, a photo by nevardmedia on Flickr. A light Freightliner 66618 laps 37422 heading a scrap metal working on the up slow. Digital photography as a tool to modelling means that we constantly try for better levels of detail, or quality of the detail. The Vi-Trains class 37 above is just such an example, for when I added the detail pack and weathered it up 3 or 4 years ago I was very happy with it. Now I look at the lamp irons and windows in particular and think that they could be so much better. Of course when we see such models with the naked eye from several feet away at a show they look spot on, but close up photography like this highlights those smaller things that could be improved somewhat. The wonky plastic lamp irons from the detail pack look just like what they're supposed not too, and the prism effect of the glazing and heavy windscreen frames look crude now. I am pleased with the finish though, so it's unlikely that I'll be doing any more with that. Time permitting I'll address the lesser bits with some etched bits and some Shawplan glazing, if only to please the lens of the camera - for I have plans for another modern day (ish) industrial layout emerging on the back of an envelope. As primarily a steam era modeller I'll have to gen up on those diesel detail suppliers now, which from what I can see is a constantly changing arsenal of better and better bits. I also have a Lenz DCC package on long term loan, so once I've fathomed what it's all about there's scope for proper lighting and maybe even sound - expense allowing of course! 120419_Midland2P_DSC_3840_BW, a photo by nevardmedia on Flickr. 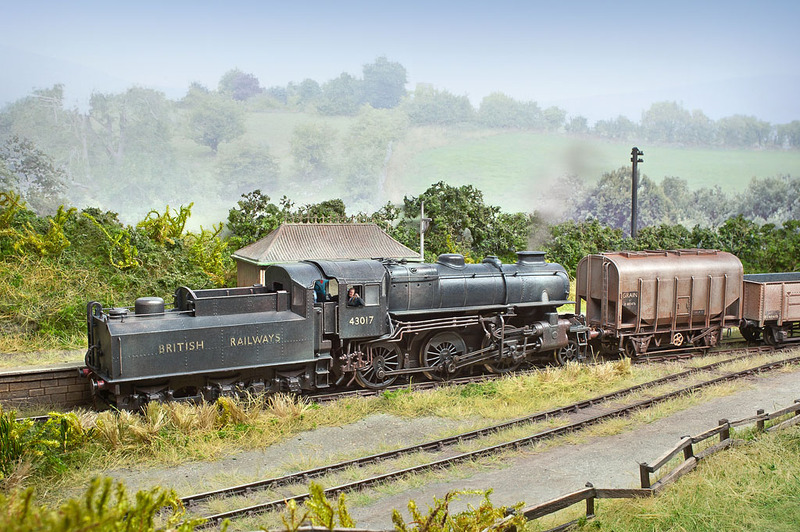 It's a misty October morning in 1957, as and LMS 2P 4-4-0 is captured powering along the Midland Mainline a few miles south of Ambergate (location suggested by Model Rail's Ben Jones). Although it's misty, it appears to be a 2 coach train which to 40564 will be light work for such a graceful athletic engine. Of course this is a model, quite an old one in fact, it being an ex-Mainline loco dating back to the mid-1980's. But proportion wise I think it's spot on, with it capturing the look and feel of these elegant machines so very well. The drive is one of those rubbish tender drive units, so less said about that the better, but Hornby have recently re-released this loco with a proper loco-drive, so I might will invest in one just for the chassis, that's if the new tooling matches the old. The track is Peco code 75, but some proper chaired bullhead from the likes of C&L might be better for this period set piece along the addition of some fishplates to suggest 60 foot sections of track. I will add the fishplates in due course - time permitting! Flatbottomed rail started to be used in Britain from around 1950, so it's not too far off, but unlikely to have been seen on the outer slow lines in the mid-1950's. We unveil our next exclusive ready-to-run ‘OO’ gauge locomotive. Ben Jones and Ben Ando report on another ambitious new range of ‘OO’ and ‘N’ gauge models from Bachmann and Graham Farish. Dapol’s new ‘A4’ and ready-to-run signals, Hornby’s umber & cream ‘Brighton Belle’ and Bachmann’s new ‘Cities’ are the stars of this month’s selection of new models. Paul Rolley had to contend with a two-month deadline and a tight budget when he built this homage to Cardiff’s steel industry. Chris Leigh shows that there’s more to Royal Train operation than just a clean locomotive and claret coaches. Drilling into baseboards is one thing, but what about delicate items such as models? George Dent shows you how it’s done. There’s a new budget airbrush on the market and George Dent has put it to the test. Peter Marriott shows you what you need to re-create Mother Nature’s vibrancy in model form. Just because a locomotive didn’t exist, it doesn’t mean you have to skimp on the detail. David Deadman has come up with a few refinements for Hornby’s ‘4-VEP’. 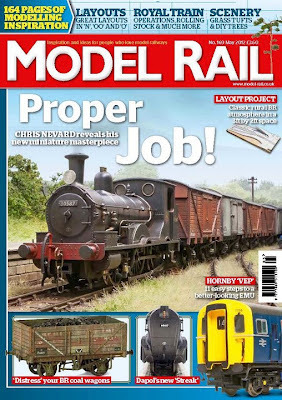 Chris Moorhouse assembles Dapol’s LMS 57ft coaches, and suggests how to improve them. George Dent finds that there’s still plenty to see at Crewe. 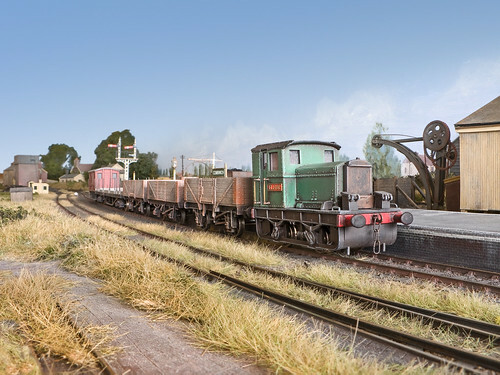 Alan Simmonds explains how he created the superb greenery on his ‘OO’ gauge work-in-progress. A teasing glimpse of our special issue dedicated to all that’s best about the East Coast Main Line. A most unusual working has been captured here of Ivatt Class Class 4, 2-6-0 No.43017 (Bath Green Park) tender working a freight through Polbrock. These locos weren't generally found this far down in the West Country, so it probably has something to do with the photographer's rose-tinted camera lens performing a little 'could have been'. Click here for a bigger version. 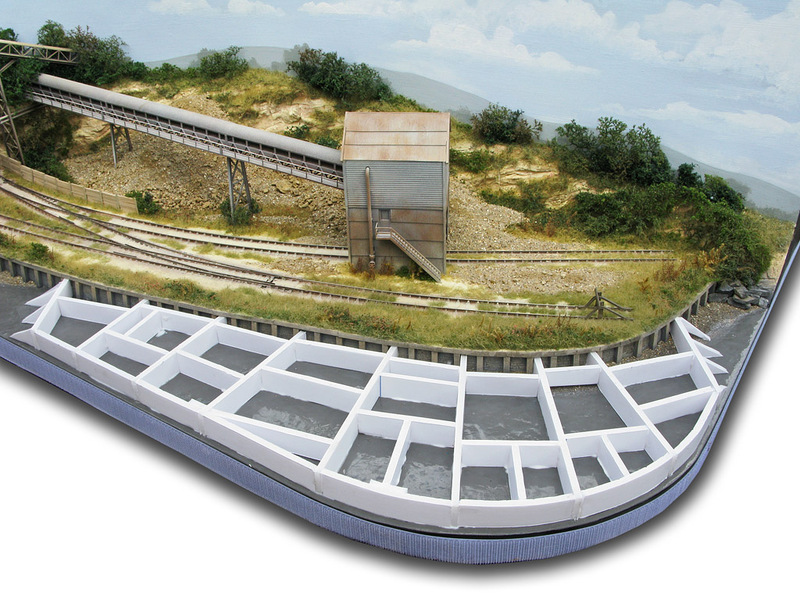 This tiny layout, all 3ft by 1ft of it will be appearing in Model Rail from next week (May 2012) as a part 4 series in the Workbench section. And whilst it won't get any awards for size or operational interest, it might just spur the person who until now has not had a go at building a layout for various reasons like space, fear and so on. Most of the simple techniques described over the period of the series will be applicable to much bigger layouts for those lucky enough to have the space or stime to devote to railway modelling. And before I sign off, who is that idiot leaning out of the cab (again)? nevard_120411_cementQ_DSC_3458, a photo by nevardmedia on Flickr. A week or so ago I mentioned adding an extra point and siding to Cement Quay - Old Quarry Wharf, and here is a photo as proof to actual progress in the form of a copper clad point. Why copper clad when the other points are Peco with C&L plain track? The reason is mostly due to geometry of trying to squeeze in track to a spot that was never originally going to have a point. The new point will look different, but the joy of such a location is that much of the track will be under a layer of spoil and weeds and once blended in with existing scenics should match well. Industrial oocations often use second hand track too, so any slight differences will be quite acceptable. Next it needs to be wired, with polarity switching for the frog/crossing vee and feeds to the toe of the point. The operation will be manual as with the other 2 points which use rods under the baseboard operated from the rear. nevard_110707_combwich_IMG_0058, a photo by nevardmedia on Flickr. End of the line, September 1973, a contractor's Planet 'Fleur' terminates at Combwich in preparation for removal of any salvageable scrap prior to track removal. Taken with natural window light falling length-wise along the layout from the right, giving an interesting effect because it breaks rules. I don't always like rules. nevard_120403_cementQ_IMG_2928_BW, a photo by nevardmedia on Flickr. Tuesday morning's photo I dedicate to Colin Gifford who changed the way railways were photographed in the 1960's. Until then photographers had recorded trains mostly as a strict 3/4 view, Mr Gifford changed that forever with the publication of Decline of Steam and Each a Glimpse. 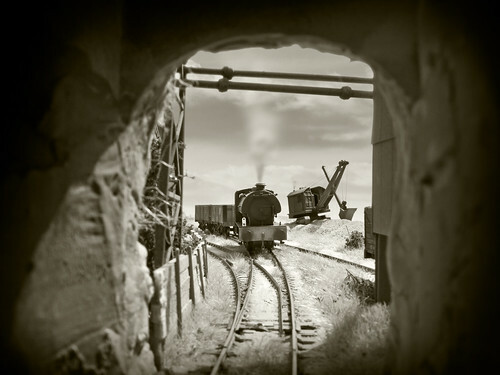 The latter book is rumoured to be re-released shortly with some new photography, and it will be interesting to see whether he influences modern railway photographers who in recent years have fequently been happy to settle for that 3/4 view again. The photo above was taken on Cement Quay, the Ruston Bacyrus in the background standing on a temporary pile of sand for this shot. nevard_120402_cementQ_IMG_2925, a photo by nevardmedia on Flickr. We all those projects that have been forgotten, or simply stalled. I'm no exception, because there's always something new to work on or maybe one is just bored or don't have the time because that nasty real world has jumped in the way - which it needs to do from time to time. 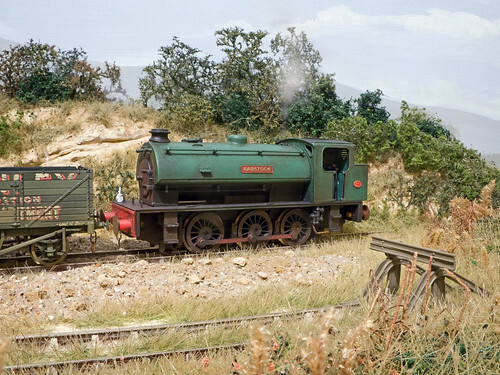 The little cameo above with the Austerity tank 'Radstock' helps create the look I'm after with the weeds and spoil ridden track, and hopefully publicly airing these thoughts will kick-start the project back into action, because people at shows will only tut if I haven't! Rebuilding Brewhouse Quay to 7ft Gauge! 110213_GQ_IMG_9193, a photo by nevardmedia on Flickr. After much deliberation I've decided to rebuild Brewhouse Quay and relay the track in Brunel's 7ft gauge! The work started earlier in the week when I ripped all the cobbles up in preparation for removing the track. Here is a quick snap showing the layout just before the track was prized off. For the new track I'm going to hand extrude the mild steel rail through a special jig to ensure the exact correct profile for GWR bridge rail from 1876. The rails will then be hand spiked to miniature Baltic pine sleepers and the of rail length joined with tiny scale flashplates, nuts and bolts. After much looking I have managed to find a manufacturer of bespoke 1/76 scale 4 sided nuts and scale length 1 inch diameter bolts. 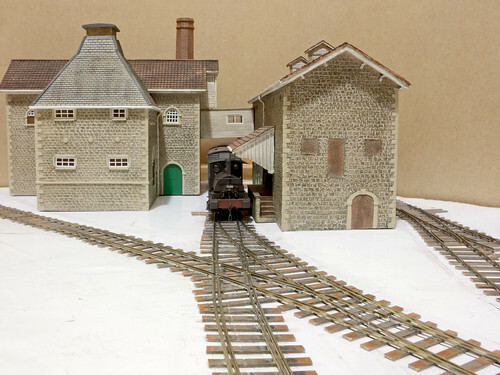 I'm currently looking to booking this layout in for its first outing in 2021, because I'll need to build all the stock and back date the layout to the latter half of the 19th century. Then after this show I will extend it by 10 feet to allow a working recreation of Brunel's Atmospheric Railway using Sparklet CO2 bulbs to generate the 'air pressure'. At this stage I'm unsure how to recreate the not so airtight seal so beloved of rats who noshed on it.